Communication is an essential social process. People need to communicate: to express their anxieties and their emotions, to make known their wants, and to go about their daily lives. As a volunteer you should be sensitive to all the ways in which a patient may try to communicate, whether these are verbal or non-verbal. In certain illnesses where the patient has difficulties in making his needs known, what little verbal communication there is may be especially important from a practical point of view, while non-verbal communication forms a valuable basis for many observations. Animals exist entirely without the spoken word. They make friends, find mates, rear young, establish their territories and co­operate in groups using only expressions, posture, gesture, smell, and noises. Much human communication is also non-verbal. A person’s facial expression reveals if he is happy or angry. A sagging posture suggests weariness, dejection or unhappiness. The outstretched arms of the mother promise love and security. A handshake is a mark of introduction and acceptance; in some business circles it acts as a bond. Move­ments of the head may denote agreement or disapproval. From earliest childhood we are taught to recognize these signs and many others. Learning to be sensitive to them is part of learning to live in society. It is not difficult to apply your knowledge of people in general to the patient. When entering a patient’s room you observe his face: he may look tense, totally blank, or have a face screwed up with pain. Caught unobserved, the weary or dejected person slumps in the bed or chair, the depressed person tends to huddle in a corner, and the person with a headache lies with his face turned away from the light or with his hands covering his eyes. The person with abdominal pain tends to lie on his side and draw up his legs. The frightened person grips your hand or arm, the frustrated child bangs his head against the side of his cot and the agitated elderly person mutters to himself. These signs of the patient’s feelings are all relatively obvious; the better you know an individual patient, the more easily you will come to recognize non-verbal signals far more subtle than these. 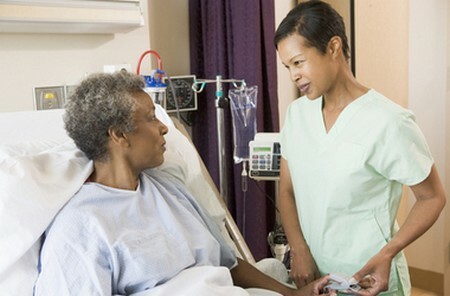 Under­standing the unspoken feelings of your patient, however they are expressed, will help you to care for him better. Verbal communication is fully as important as non-verbal. If you cannot understand another person because of a speech impediment or the inability to speak his language, you cannot exchange ideas or share experiences. Communication is reduced to exaggerated gestures and mime. It is like shopping abroad when you do not speak the language, and can be a very depressing experience for people of all ages. When English is not the patient’s mother tongue, there are many sources of help available to the volunteer. Local authorities and some voluntary organizations often produce a range of multi-lingual leaflets to help with language difficulties, and the numbers of interpreters willing to lend their services are increasing. The volunteer should always try to use adults as interpreters, as a child’s vocabulary is often not wide enough to communicate adequately. Verbal communication can also become a problem if disease or damage interfere with the normal speech processes.